Many of you will know Pete Moon and Steve Cronin, who are part of Kerith and run their own bathroom and kitchen fitting business. Last October they visited a church we are linked with in Estonia (the church our three Estonian Academy students came from last year) to check out the possibility of taking a team to Estonia to work on renovating their church building. 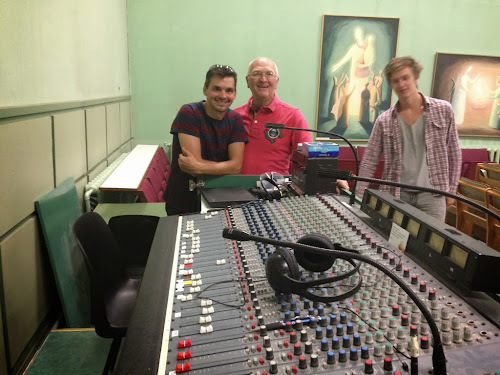 The church out there has been given a huge old communist era military building which bit by bit they're doing up (the picture at the top is of our old sound desk in their auditorium - you may also recognise Ken Bothamley and Mike Maton in the photo). That trip was a great success, and they're now planning on going out again from Friday 18th to Friday 25th July. So far they have at a small core group signed up, but they would love anyone with trade skills, those with DIY competence and also keen volunteers who don't mind picking up a paint brush to join them! They're asking people to pay for their flight and bus journey - everything else will be provided. For more information take a look at Pete and Steve's website here, email them at info@pspsltd.net or use their other contact details which you can find here. Personally I'd like to encourage you to think about going. You'll get so much out of giving your time and energy, they're a wonderful group of people out there, it's a beautiful country and it's a load cheaper than going on a missions trip to Africa (and you don't need any injections!). Alur, the pastor of the church, and some of his team are visiting Kerith next weekend. If you see them then please say hello as they're a great bunch.